Project Kyoko-Goal for Project Kyoko in 2013? Found this image surfing through Miata forums. What do you guys think? Should Kyoko transform into this for 2013? This entry was posted in Daily Driver Projects and tagged Kyoko. Bookmark the permalink. 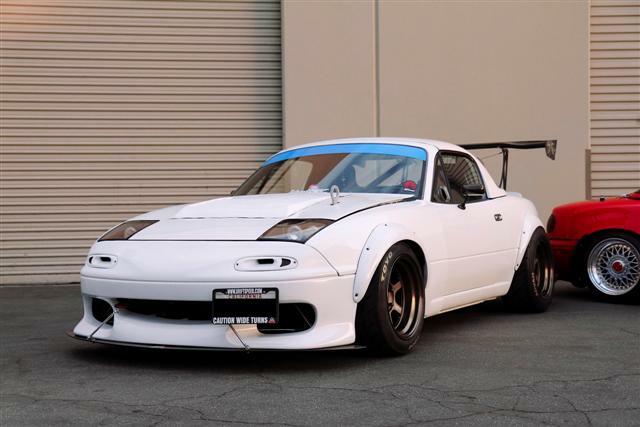 If you sign up at MazdaMotorsports.com as a racer or building a race car (auto-x counts), you can get the wider factory front fenders they put on the FP and EP cars (plus any oem part at a killer deal). I think they’re carbon fiber. If not they’re fiberglass. Stay away from the hood mounted tow hook. 1) It puts a hole in your hood. 2) Engine mounts break all the time which makes towing from the engine a really bad idea even if it looks cool. Not sure why the guy has an air inlet in the turn signal on the *opposite* side of the intake. It’s going to direct air around the radiator and make it run hotter. haha. i have recently taken a liking to this widebody kit from Garage Vary. but i’m afraid my pockets aren’t deep enough, and my wheels aren’t wide enough lol. Oh yeah, and cars look super tacky with improper offset.